Client onboarding meetings can absolutely galvanize a business. More than just creating a consistent practice for new client intake, this process sparks deep empathy for the customer experience and can often lead to evolved ideas that weren’t on the radar before. Landing a new client as an agency is always exciting. No matter how long you’ve been in business — or how big your company is — the feeling gets old. What comes right after, though, is often a rough spot for businesses: moving from excitement into the nuts and bolts of working together, from closing the deal to holding the first project meeting. Without a defined process, not only will your team dismantle with an increased workload but the loss of clients is also a significant risk. Whether it’s about the immediate deliverables after signing a new client or hosting important client files in a central location, an onslaught of decisions come with bringing on a new partner. There’s still a more frequent problem that can potentially hurt your business the most because it stops agency leaders and execs from delegating: the folks at the top land a big client, but then they stay more involved in getting them onboard than they should. It’s because they don’t believe the new client will get the VIP treatment otherwise — without confidence in their onboarding processes, it’s hard to let go. Everything considered, agencies and companies are risking disappointing their clients, wasting their execs’ time, and missing opportunities to scale. Redbooth has become the liaison in this process for our agency customers, and we’ve learned quite a bit about what it takes successfully sustain long-term client relationships. We took a look at how marketing and creative agencies are managing the workflow of new client projects. 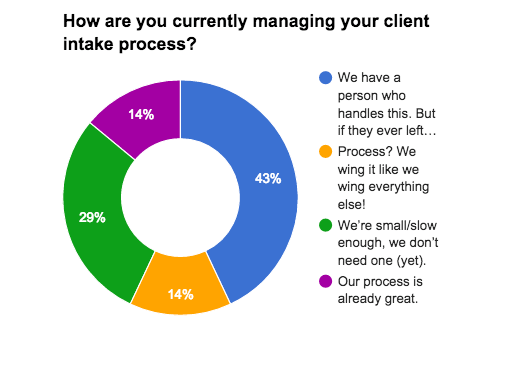 Could your client intake process use a makeover? Let’s explore four steps you can take to transform your current system into a streamlined, scalable process towards more repeat business. It’s not easy to carve out time, to circle and brainstorm to make the most calculated processes. For some businesses, finding the time is the hardest step, especially when managing multiple clients! Even when people understand the value it can bring, it can still be tricky. 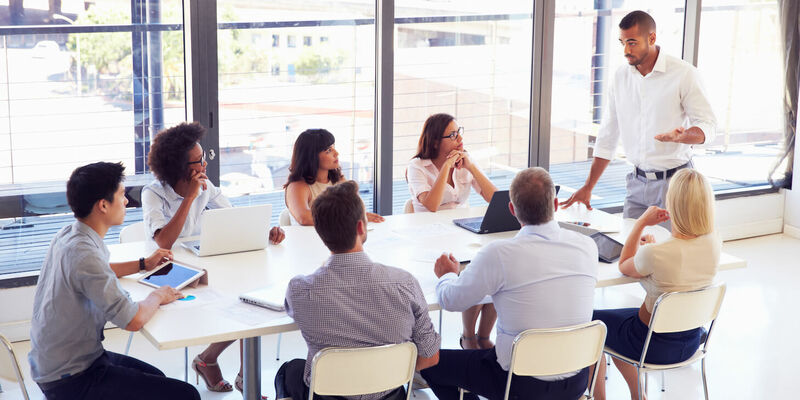 The pressure of day-to-day business can feel even overwhelming, but these meetings should become a recurring event in your schedule. It helps your team escape overhead, by allowing them to focus on weekly deliverables and how those responsibilities are delineated amongst team members. You want attendees who can represent the client experience, as well as the team members who will be completing the work. You’re shooting for a mixture of executives/management, department leads, and team members. Ideally, you also want the final result — your new client intake system — to be both aspirational and practical. The right balance of people in the meeting will make for an intake process that’s both achievable for your team and rewarding for clients. Having these different perspectives allows the entire team to collaborate on the high-level strategy of client projects which, in turn, defines that minute tasks that are required to reach the finished product. 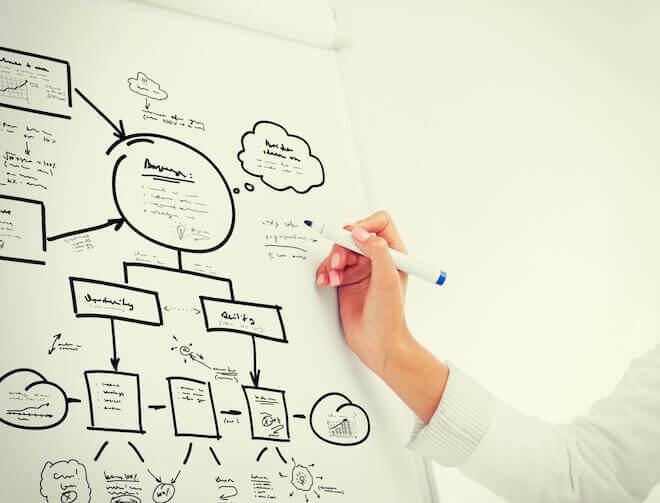 During your meeting, you’ll be charting a roadmap for both the client and your team, and collecting “lists of lists” of action items and deliverables. While the client onboarding process is linear, your team’s brainstorming might be anything but having it all visual will keep ideas organized, while not constraining any of the idea generation. If you’re all in the same room together, you can only use a whiteboard and markers. If you’re a virtual team, you’ll want a shared document or workspace that everybody can view in real time. During your meeting, you will surely come upon items that need to be created, documented, or expounded upon separately. Your intake process won’t be fully complete until these “extra” items are completed. These intangibles are a large part of including the elements that turn your one-off projects into repeat business. Recording the turn out of brainstorming sessions is a necessary start, but turning these ideas into action items that you delegate amongst the team’s responsibilities so that they are easy to assign, makes everything come together faster. You may be tempted to deep-dive on a specific item you just brainstormed. The team has just put together some great macro ideas, and you’re eager to start chopping away at building on these thoughts. Not so fast! As a department lead or project manager, resist falling into these rabbit holes in this main meeting until you can collect your thoughts and designate them accordingly. Coming to a quick consensus on regular response times or business hours is great — but brainstorming the entire escalation procedure for emergencies is not! 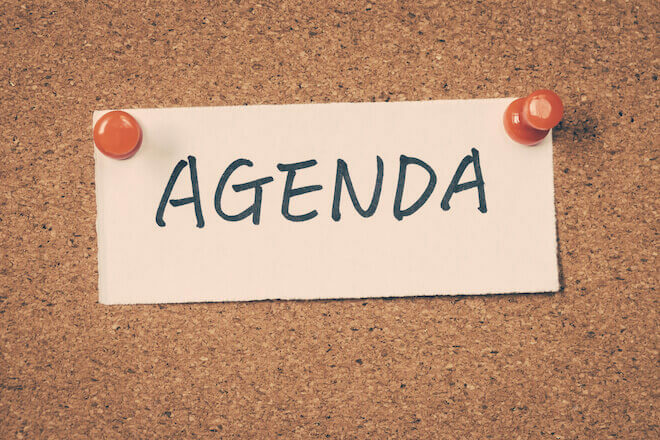 Once you identify topics that require further discussion, put them aside and make plans to address them after the meeting. Beyond the meetings and defining your approach to new clients, here’s an agenda to follow to get the most of the new client brainstorming. The first step to smooth operations is a plan to get the deal closed smoothly, with all the right things in order. List all the steps that will need to happen as you complete a sale: from the initial verbal yes to the signed agreement. Now, think about your internal systems and make sure they’re set up to start work with your client. Make a list of all the systems or software that you’ll need to add your new client too — such as invoicing, project management, time tracking. Next, you want to begin to plan and strategize — prioritizing this work with the existing workload, identifying the work team, calling the first meeting and building out the project plan. IV. Client Onboarding and Training: What’s working with your team like? Now you want to turn your attention to the client experience. Think client training is a necessary evil? Au contraire. Clients don’t just buy the end product, they buy the whole experience of working with you. Now is the time to differentiate yourself from your competitors and let your clients know that they’re in good hands. V. Welcome Packet: Impress and delight! What can manage expectations and solve problems before they start? A beautifully branded PDF — customized with your client’s name — that outlines procedures, deadlines, expectations and routines. Redbooth is home to a lot of marketing agencies both small, in-house teams as well as larger, remote organizations. Manage your clients with a platform that makes onboarding and progress clear and efficient. 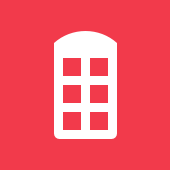 Sign up for Redbooth today!